Cold temperatures characterize the ringed planet's outer atmosphere. 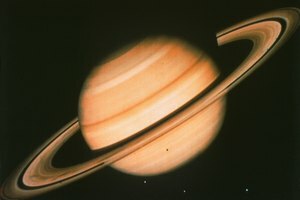 Saturn, the second-largest planet in the solar system after Jupiter, orbits at an average distance of 1.4 billion kilometers (887 million miles) from the sun and, compared to Earth, receives little warmth from it. Consequently, temperatures in the upper atmosphere are cold, making a holiday in that planet -- if you could stand on it -- an uninviting prospect. Things warm up deeper inside the atmosphere, however, and astronomers have noted a hot spot around Saturn's south pole. 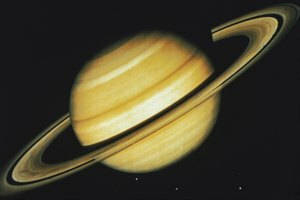 Saturn isn't what Earth-dwellers would consider a solid world, although it does have a solid core with a mass about 10 times that of Earth. The atmosphere of hydrogen and helium that surrounds the core is so thick that scientists believe that it compresses the hydrogen at the core's surface to a metallic liquid. The forces of compression are powerful enough to create a core temperature of over 11,000 degrees Celsius, or about 20,000 degrees Fahrenheit. 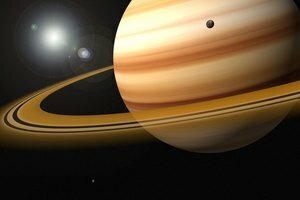 The energy that radiates out into space from Saturn's core is about 2.5 times the amount that the planet receives from the sun. Moving away from the center of the planet, temperatures gradually get colder. 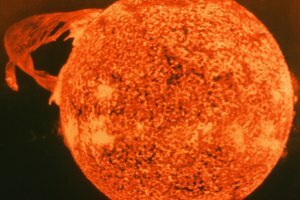 At the point at which hydrogen turns into a gas and the pressure is comparable to that several miles under the surface of an ocean on Earth, the temperature is about 57 degrees Celsius (134 degrees Fahrenheit). Above that is a cloud layer of water ice, where the temperature ranges from minus 3 degrees Celsius (26 degrees Fahrenheit) to minus 88 degrees Celsius (minus 127 degrees Fahrenheit). Still higher are clouds of ammonia ice, where the temperature is between minus 113 degrees Celsius (minus 170 degrees Fahrenheit) to minus 173 degrees Celsius (minus 280 degrees Fahrenheit). 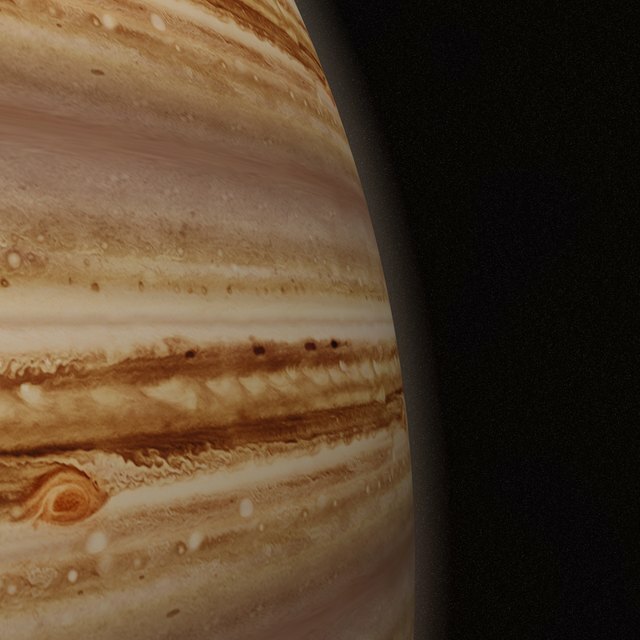 When you reach the outer layers of Saturn's atmosphere, which are the layers visible to observers, the temperature is around minus 150 degrees Celsius (minus 238 degrees Fahrenheit). This temperature doesn't vary much from the equator to the poles because it is driven not by the sun but by heat generated by Saturn's core. 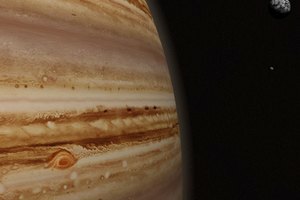 Saturn's upper atmosphere is home to some of the strongest winds in the solar system, reaching velocities of up to 1,800 kilometers per hour (1,118 miles per hour). By comparison, the strongest hurricanes on Earth reach top speeds of only 396 kilometers per hour (246 miles per hour). In 2004, astronomers using the Keck I telescope in Hawaii observed an unusually warm region around the tip of Saturn's south pole. It isn't much warmer than the equator-- only 2.8 degrees Celsius (5 degrees Fahrenheit). They believe it is caused by a polar vortex, which is a circular wind pattern. Other planets in the solar system, including Earth, have polar vortices, but the ones on those planets are colder than their surroundings. 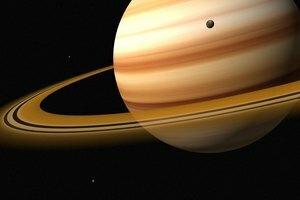 To add to the mystery, the temperature approaching Saturn's pole doesn't warm gradually, but does so suddenly at two distinct latitudes. When the north pole emerged from winter shadow in 2009, NASA's Cassini spacecraft observed a similar vortex there. How Does Age Affect the Temperature of Stars? Deziel, Chris. "Saturn's Temperature Ranges." Synonym, https://classroom.synonym.com/saturns-temperature-ranges-29344.html. 26 September 2017.